American Bridal has an amazing offer on their Tote Bags, you can save up to 65% and get free personalization. 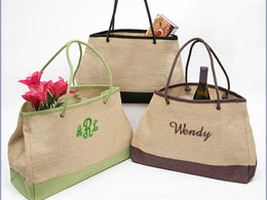 These elegant Jute Totes are now only $18.95, making them a great gift for your bridesmaids. If you spend $125 use discount code 20off at the checkout to receive a further 20% off, plus get free shipping. Get shopping now, they have over 50 styles of tote bags to choose from and this great offer runs out on Sunday 28th August.